Looking for more information on how much money I’m making online? I share a lot of my income results – not everything – but a lot and below you will find a summary of all the income reports and information I currently share. I first started making money on my first blog, my site on longevity and health, and then quickly started making money on eHow – in fact I wrote a long guide to improving your eHow Income which is quite notable now that eHow closed their Writer’s Compensation program (WCP) back in April of 2010. You can still write for Demand but the classic publications on eHow are no longer available meaning this guide is the best way you can increase your eHow income if you want to put in the work necessary. I don’t really go into detail on my eHow earnings but I used to provide some relatively detailed statistics every month here on this blog. Suffice to say that I have 77 articles published on eHow which were primarily published before I knew very much about what I was doing and yet I still make roughly $250 per month over there. If you are an eHow nut you may want to check out my main eHow Earnings page here on this site. Soon after writing for eHow I started writing for InfoBarrel – see my InfoBarrel Review here for the lowdown on this site – where I initially wrote the majority of my backlink articles at. I used InfoBarrel initially for a backlink source to my first blog and to my eHow articles and only later on did I realize how much money I could make by actually focusing on using InfoBarrel as a “money site”. Of all the sites I write for InfoBarrel is the one site where I consistently publish my full income reports on a monthly basis actually on the Infobarrel site. Currently I am making a little over $600 per month on InfoBarrel through a combination of Adsense, Chitika, and Amazon earnings on the heels of a bit more than 300 published articles. I’ve found that many people have many different opinions about InfoBarrel. A lot of people don’t like the site and a lot of people love the site. Interestingly I get the impression that experienced internet marketers, SEO folk, and knowledgeable content publishers value InfoBarrel for what it is and are able to make good money there either directly or indirectly by promoting their money sites - I do a bit of both. Conversely, it seems that the newer writers, the “newbies” of this online enterprise, or the really low volume writers who do not think of this as a business but more of a hobby don’t like InfoBarrel. I think this is because they simply don’t know what they are doing wrong or are unwilling to work hard and treat their publications like a business. In any event I make a lot of money on InfoBarrel as you can see from the above reports and I recommend you signup there and use the site to your advantage. I don’t sell anything so I’d invite you to at least use my referral link if you do signup. In addition to he aforementioned sites I also make money on a number of supporting websites which I also use for backlinks to my other “main” publishing sites. I utilize Hubpages, Xomba, SheToldMe, InfoPirate, Posturown, Snipsly, and Squidoo which are all revenue sharing sites. I don’t ever go into detail on how much I make overall on these sites nor do I pretend to have single accounts at them either – all combined I’ve got a handful of accounts some which are monetized and some which aren’t and I use them all to make some side money while I promote my main “money articles” as well as important or interesting pages of others online. Of all these HubPages is a site much like Infobarrel that could be used to make a huge revenue stream all by itself but the others in my opinion are merely good support sites. Infobarrel offers a minimum 75 percent adshare which is better than the rest (Snipsly & Posturown excluded) so it gets my vote as best place to focus on… if however you were to choose HubPages you would be doing just fine as well. Again, if you signup please use my referral link. Thanks. For me these sites make a significant stream of revenue that I would miss if it were to go away. Let’s leave it at that. Lastly like many other bloggers, content writers, affiliate marketers, and site builders I have a small collection of web properties that I have built over the last couple years on top of this blog and my longevity blog. One such site is my Diabetic Shoes site which is my project as part of Pat & Tyrone’s Niche Site Duel. This is a classic niche website which is designed to provide tons of valid and helpful information to people you have diabetes and need information of diabetic shoes and foot care. Because diabetes attacks the lower limbs so significantly in diabetics there are large swaths of people who could use this information in an organized way and I intend on delivering it to them. As of this writing I do not sell anything on the website – I merely provide information and provide affiliate links in conjunction with contextual advertising to compensate me for my efforts. In the future as the site continues to develop I may change my tactics but for now this method is low maintenance and passive which is ideal. I also have a other web properties which are similar to my Diabetic shoes website but those sites are part of my anon collection of web properties and as such I don’t disclose what they are or how much I am making on them. As for my diabetic shoes site however, I have created the framework of the site, built some strong information filled pages and lightly promoted the site over the past two months and am regularly reporting on this site here on this blog. The site directly has earned me $37.86 over the past 10 weeks and indirectly it has earned me an additional $24.21. In the future I will begin providing monthly updates on this site specifically. 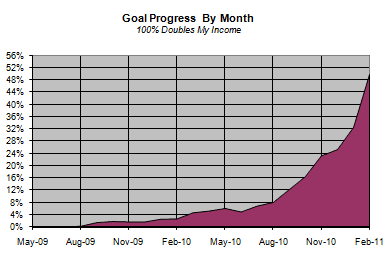 Edit: As of month ending March 2011 this site is making me roughly $100 per month. As I previously said these sites are monetized either contextually or via various forms of affiliate sales. Some sites are monetized via a combination of the two and they all perform as well as can be expected given the amount of effort I have put into them and every month my earnings seem to increase in aggregate. Talk in this niche has been dominated these days by the concept of brand so I will consider myself a brand – why not? This site really isn’t monetized other than the few things I link to with affiliate codes like account signup links to InfoBarrel, HubPages, etc. and more predominately with my affiliate promotion of The Keyword Academy (TKA). I don’t publish how much I get from these promotions because some of the links can’t be parsed out of my aggregate earnings from the sites in question. The main money I make in this neighborhood is through my promotion of The Keyword Academy’s membership continuity program. This is one affiliate program I believe in to the bottom of my heart and deeply suggest you signup for. As you will see at the bottom of this post my overall income online took off when I became a member of The Keyword Academy and assuming you are capable of doing work and treating this like a business then I’m secure in believing the same is possible for you too. I recently wrote a detailed article on InfoBarrel on using Niche Refinery (the keyword identification tool for TKA members) and previously wrote a long review of how TKA members easily obtain guestposting opportunities through Post Runner which is also only available to Keyword Academy members. Lastly you can read this recent post on how you can use PostRunner to get free content for your blogs. I myself am a paying member of The Keyword Academy and I deeply encourage you to do so as well. This is part of my monthly income (TKA affiliate commissions) so I would hope you would signup for their free trial month with my affiliate link and help me pay the bills while you learn to do the same. In addition to my TKA affiliate earnings I have been expanding into affiliate sales on some of my other anon blogs. I have made some money on some of the more popular affiliate networks like Clickbank, Amazon, Shareasale, and Commission Junction - you can be sure that this is an area I look forward to expanding into for more diversification. On the whole I started out in this enterprise in the Spring of 2009. I was green but I was willing to learn and work hard. In April of 2010 I joined The Keyword Academy and ever since my earnings have increased quite dramatically across the board. A long time ago I set a long term goal to replace my day job income 100 percent and although you don’t know how much I make in my traditional field you should know that 100 percent on this scale is my actual salary when I started this blog 18 months ago. I have yet to achieve my long term goal of duplicating my income but I am getting closer and improving my earnings faster with each passing month. Here is where I stand through February 2011. So as you can see it’s been a long journey, I'm been improving by leaps and bounds lately, but I’ve still got a ways to go. I am confident however that in time I will be exactly where I want to be… and I hope you can get to where you want to be too. Check back later for continual updates to this post as the months pass and my income situation changes and please make sure to get involved in the comments. Thanks. Thanks for the rundown. That graph must be awesome to review for yourself. Clearly you started figuring something out in August of '10. It looks like you made more progress in one month after August, than the entire year before. Yeah August '10 was an awesome month for me but I would chalk it up to the few month leading into August being the catelyst. The last couple days of March '10 I joined The Keyword Academy and I used their tools innitially to backlink the stuff I had already published - unfortunately many of the keywords my older articles and blogs targeted were not easy to rank for even with backlinks so in July I started using their keyword Tool: Niche Refinery and started going to town on new keywords leaving the old ones from my early days behind. At that point my earnings started going up. Yes most of the results started materializing in August but it was my TKA membership which I experimented with in the Spring of '10 that gave me the tools to really make a change for the better. Found your blog from your profile on IB. I am just researching the 'write for profit share' market and noticed that your last income report is quite old now. How are things going, would love to know what the latest position is for your residual income plan. Cheers, Mark.